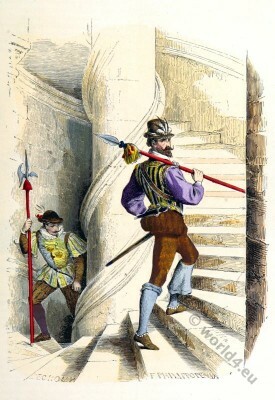 Bodyguard of the Provost. Guards officer costumes in 16th c.
Home » Bodyguard of the Provost. Guards officer costumes in 16th c.
Bodyguards of the Provost. Guards officer in 1574 to 1589. Bodyguard of the Provost. Guards officer in 1574 to 1589. This entry was posted in 1574, 16th Century, Baroque, France, Military and tagged Baroque era, Costumes civils et militaires des Français on 8/22/15 by world4.